15 inch hand-made cutting board. 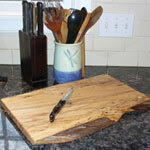 These beautiful solid wooden boards are made from spaulted maple or birdseye maple. They all have a food safe finish. After using just rinse with soap and water and dry. Hand crafted by Spencer Peterman.